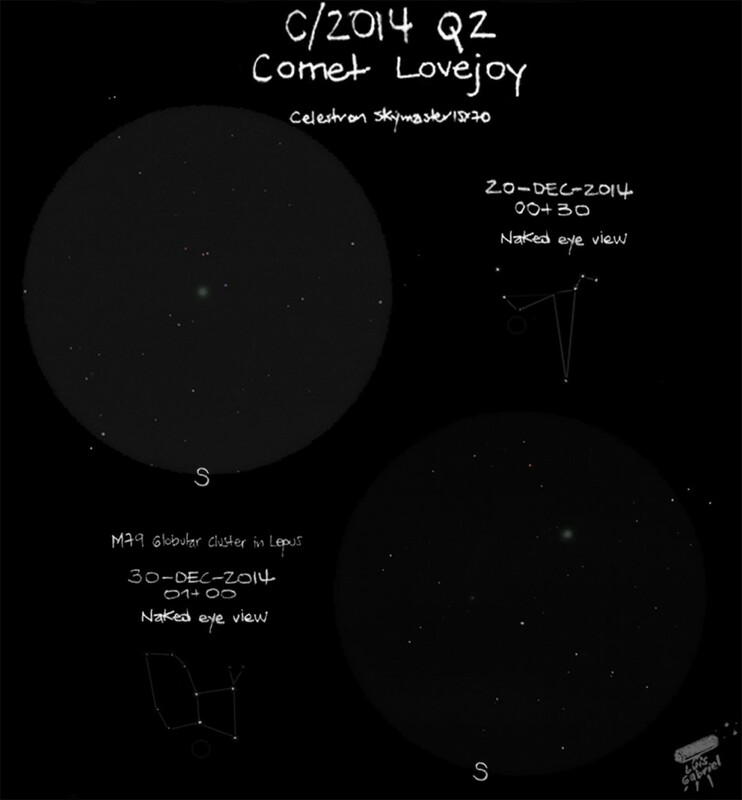 On May 25th, I’ve sketched a famous, nice object: Messier 6, or “Butterfly Cluster”, a beautiful cluster near the end of the Scorpion, celebrating a historical date in Argentina: 205 years ago, argentinians started to organize a revolution against the Spanish Empire which succeed and helped a lot to declare our Independence six years after that initial revolution, now called “Mayo’s Revolution”, which happened on May 25th, 1810. 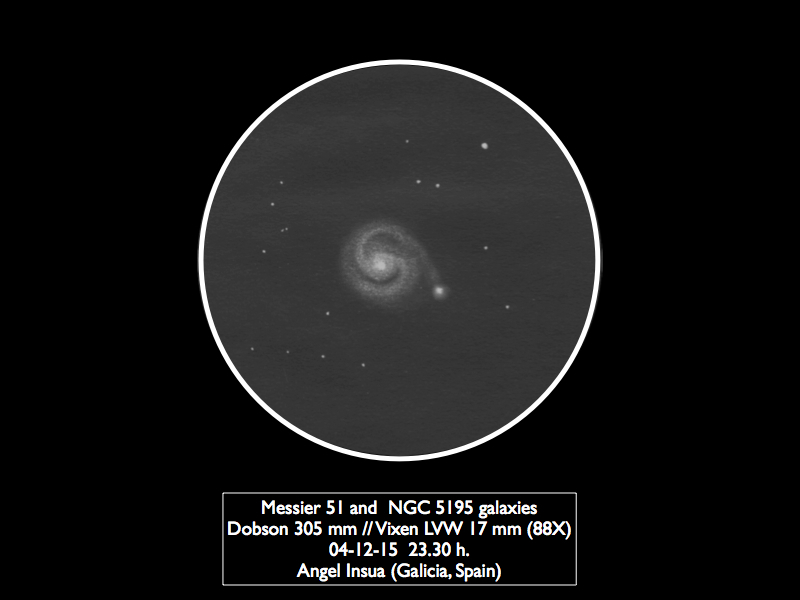 I used a newtonian telescope SW 150/750 f5, graphite pencils 4B, 2B and HB, on a white paper, and then edited with Photoshop tool. As for the title, it’s the name of a famous argentinian rock song, called “Mariposa Pontiac/Rock del País” (translated: Pontiac Butterfly/Country’s Rock), from a very famous band here, “Los Redondos”. El dibujo de esta preciosa galaxia la tenia prevista ya hace tiempo y ahora llego el momento de acerlo usando mi actual dobsom 12″ gotorizado por mi usando el sistema picgoto. 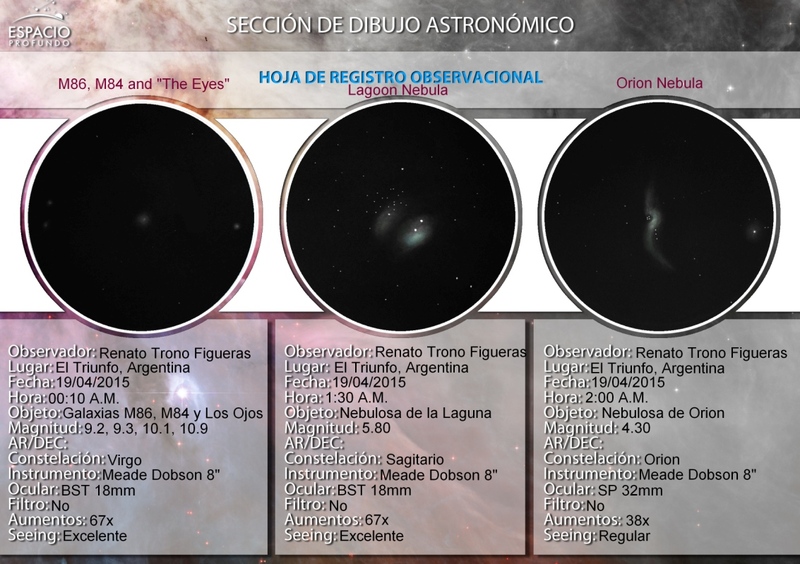 El dibujo fue realizado sobre una carta estelar de guide 9.0 con lapiz de grafito y luego invertido el color y fue dibujada observando la galaxia a 168X usando un ocular esplorer cientific 8.8mm de 82º. La galaxia NGC4565 es uno de los mejores ejemplos de galaxia espiral vista de canto que se puede ver en la constelacion de coma verenices a una distancia de 47 millones de años luz y facilmente vista con telescopios de aficionado. 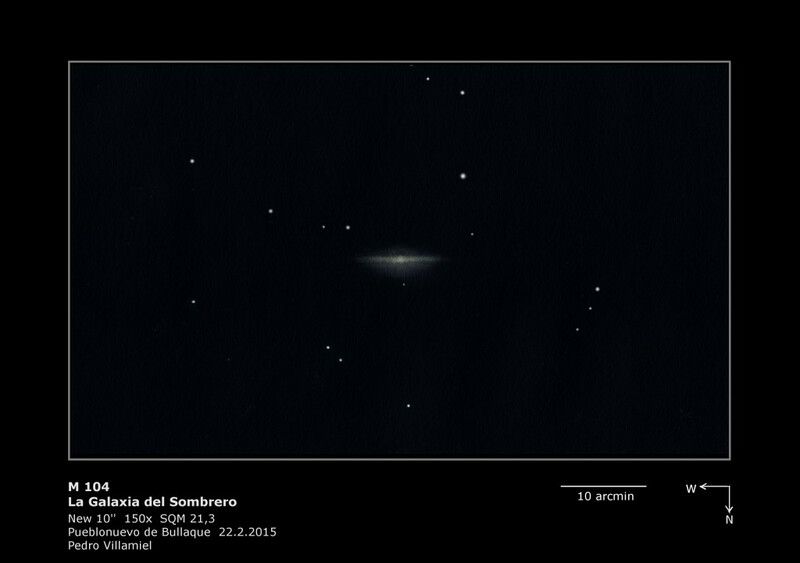 Esta galaxia es mas grande y luminosa que la galaxia de andromeda. 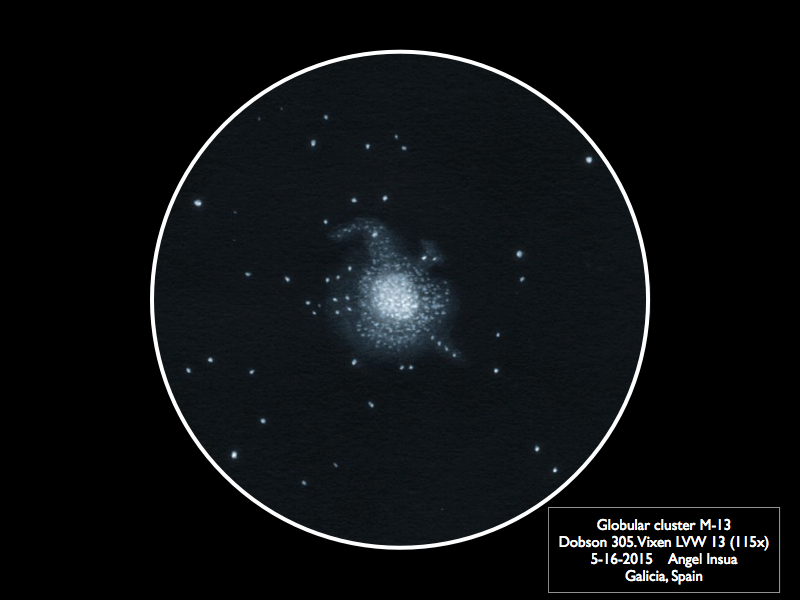 The drawing of this beautiful galaxy had planned long ago and now it’s time to acerlo using my current dobsom 12 “gotorizado my picgoto using the system. 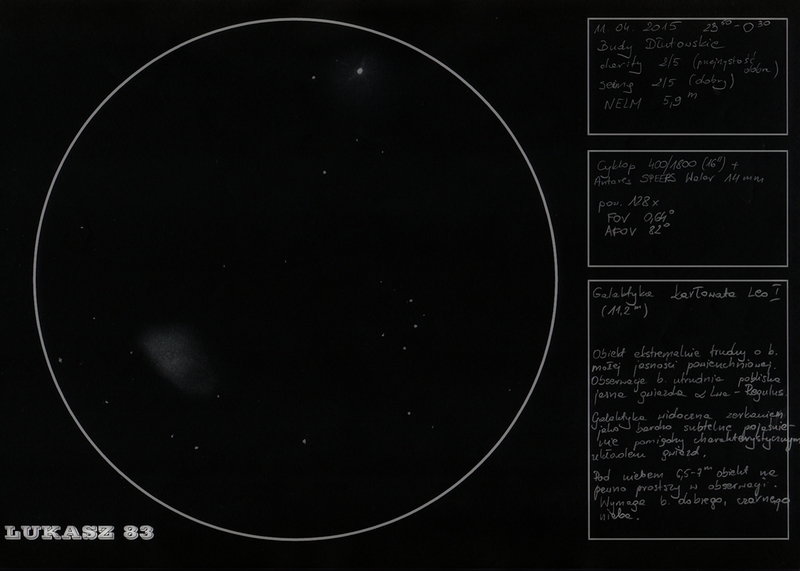 The drawing was done on a star chart to guide 9.0 with graphite pencil and then color inverted and was drawn by observing the galaxy 168x using an eye esplorer cientific 8.8mm 82º. 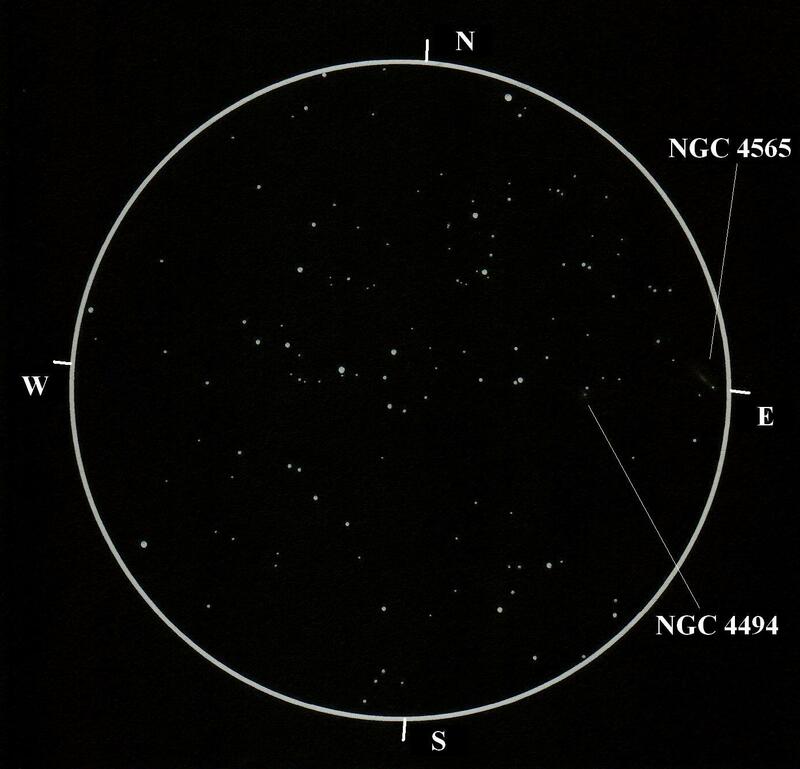 The galaxy NGC4565 is one of the best examples of spiral galaxy seen edge that can be seen in the constellation of verenices eat at a distance of 47 million light years away and easily seen with amateur telescopes. 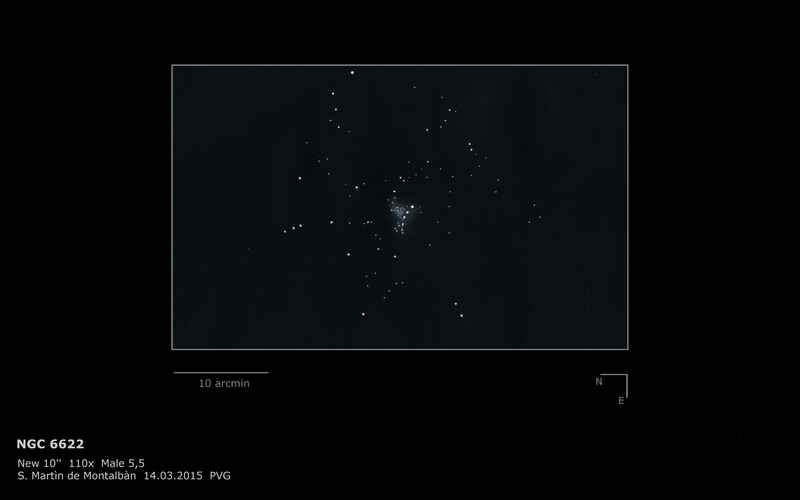 This galaxy is larger and brighter than the Andromeda galaxy. 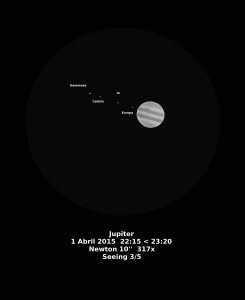 The night was a bad seeing one, so I turned to Jupiter and catched this Arrow shape formation tha I found funny. Leo I is a dwarf galaxy in Leo constellation. It is also the most distant satellite of Milky Way. 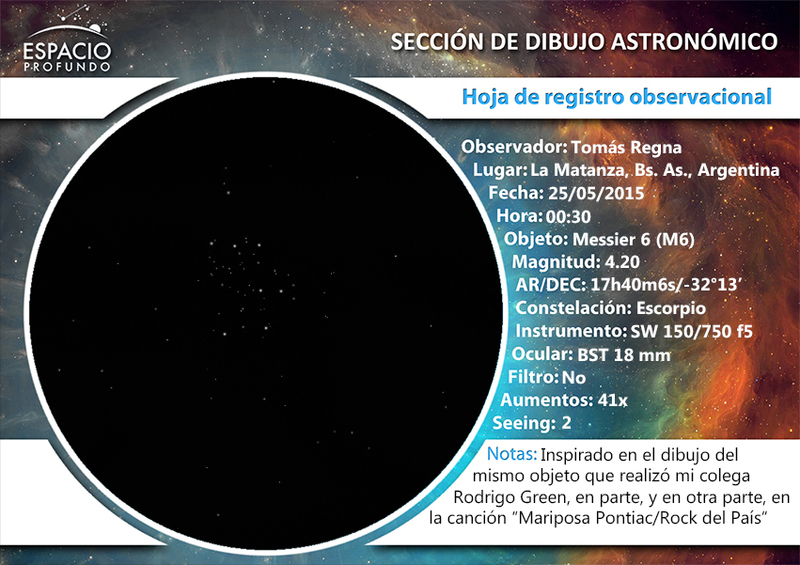 The object is extremely hard to observe because of really low surface brightness and also proximity of Regulus. 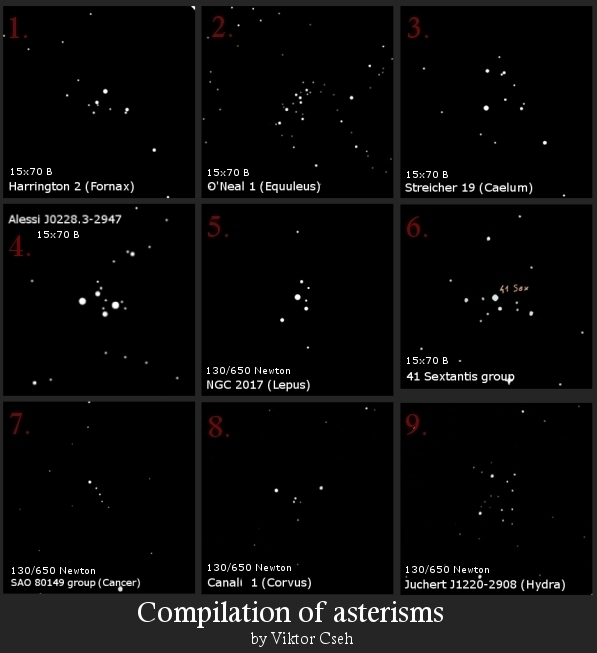 I made a small compilation for some asterisms. These are not popular objects, and few amateur astronomers watching these group of stars. 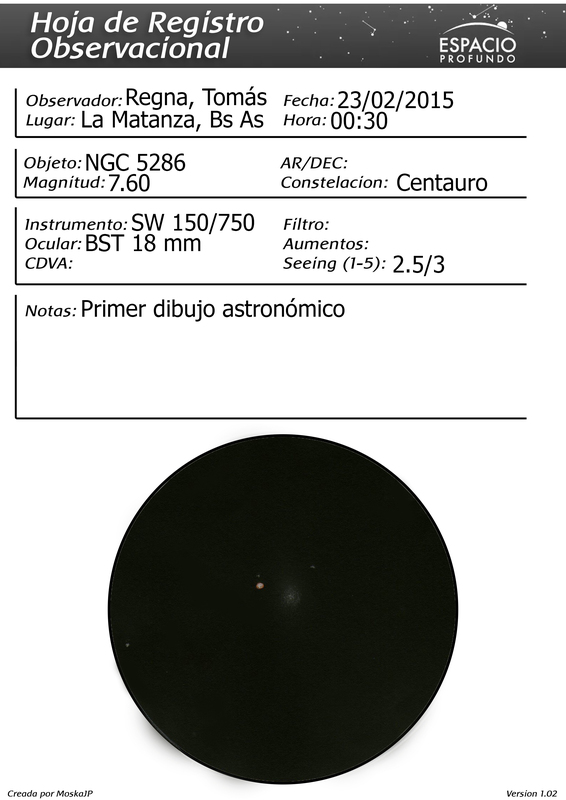 I think, you find very pretty star clusters in these catalogs: Alessi, Teutsch, O’Neal, Harrington, Slotegraaf, Ferrero, Markov, Streicher, ESO etc. You can see a lot of binoculars, and small telescope. 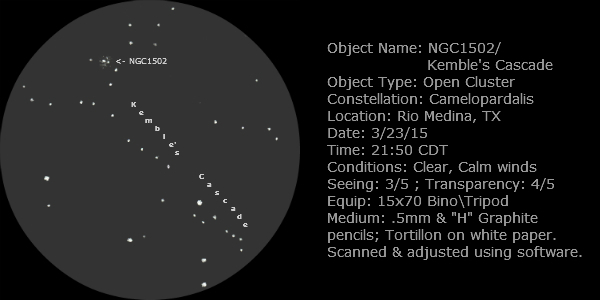 I used this telescopes: 15X70 binoculars, 130/650 Newtonian reflector. 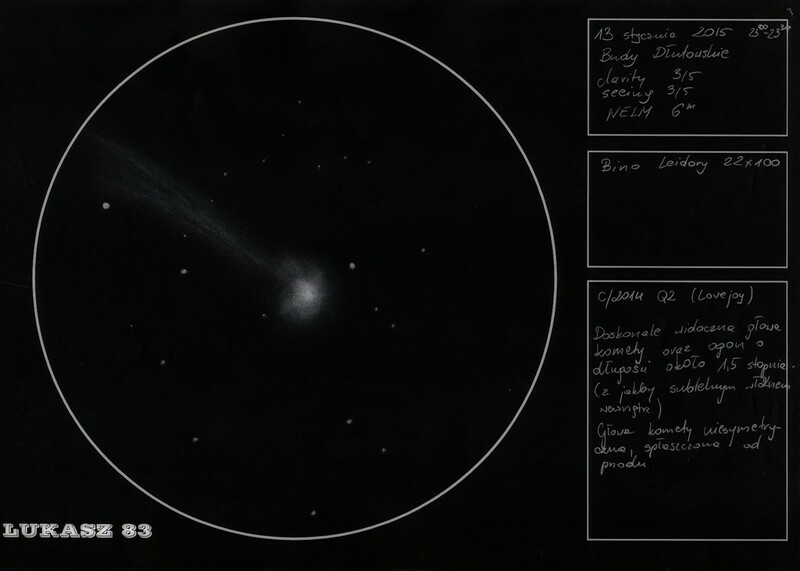 I send one sketch from january of C/2014 Q2 (Lovejoy) seen with 50X magn. 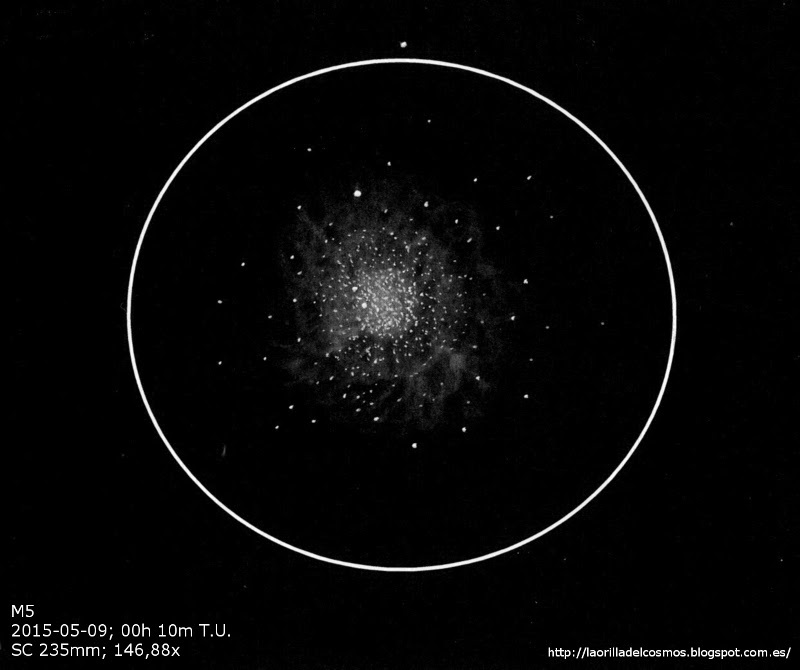 in my telescope. I could see two faint stripes in the beginning of the tail. 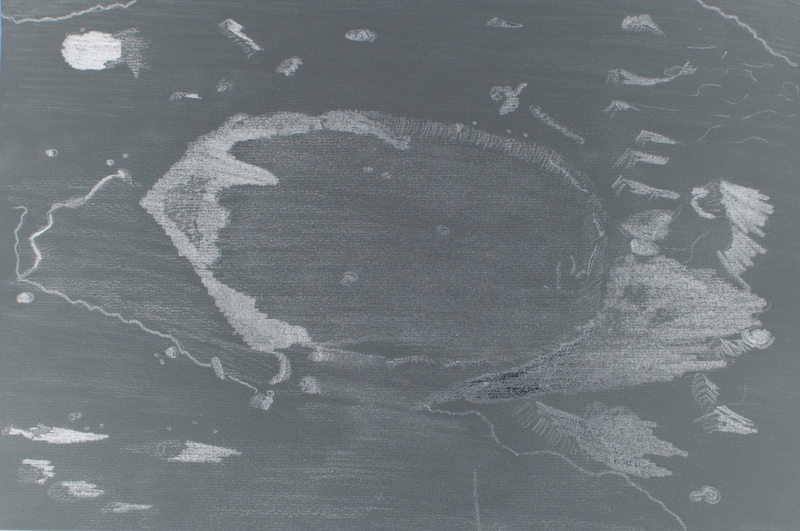 I used pencil (9B) on white paper and inverted. 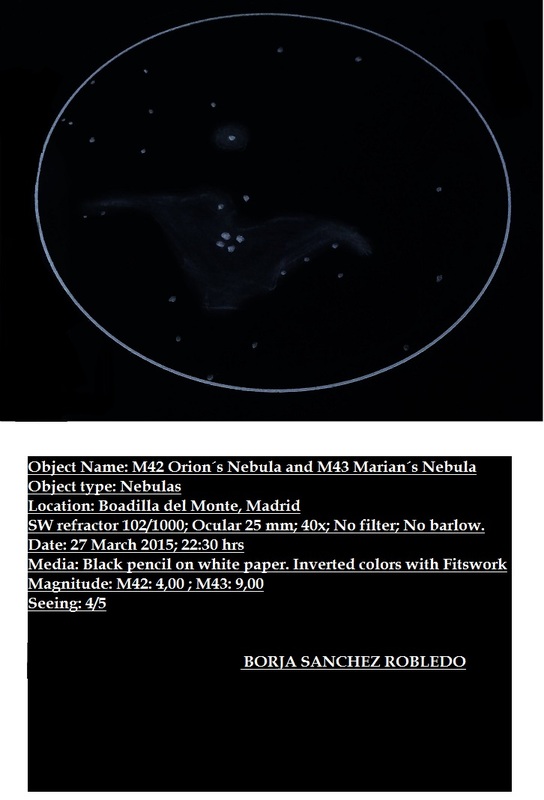 Info on my sketch. 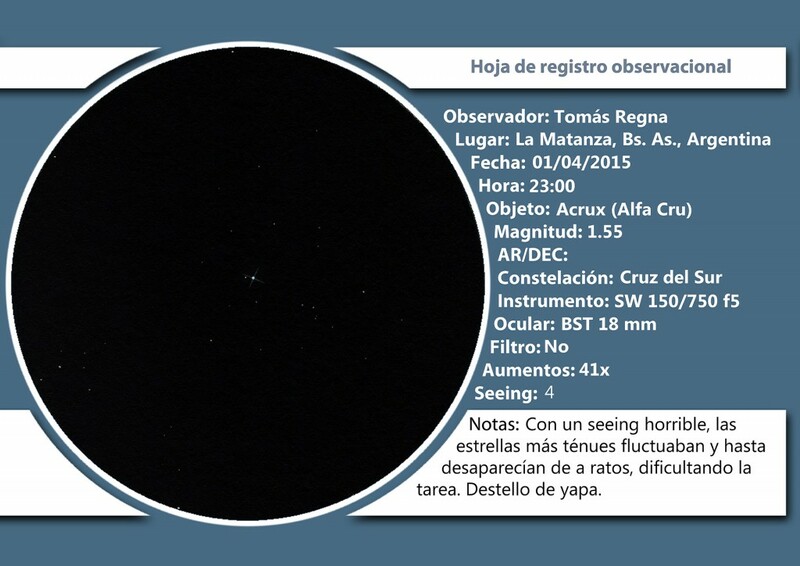 I also used 10 x 50 binos, and could see a longer, faint tail to east! 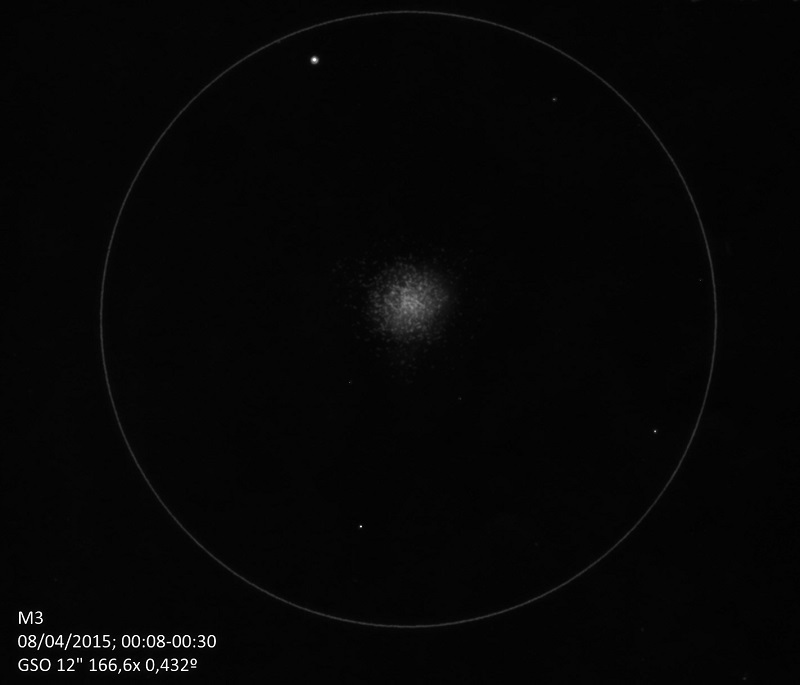 M5 is undoubtedly one of the finest globular clusters we can observe with our telescopes, But I have to admit that I was not able to show all the beauty I saw through the eyepiece, better to take a look for yourselves . On April first at 23:00 hs. 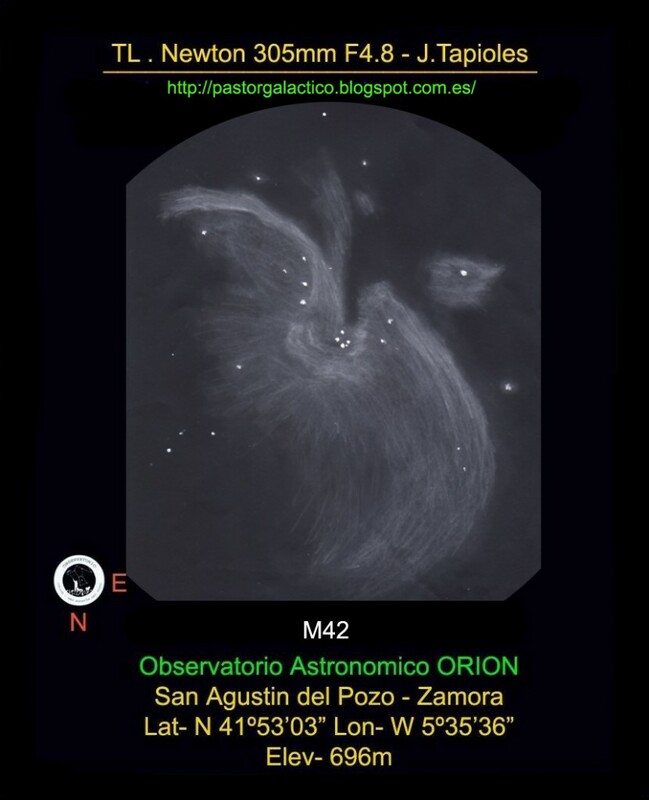 in La Matanza, Buenos Aires, Argentina, I sketched Acrux, the brightest star in the constellation called “Southern Cross”, “Crux”, etc. 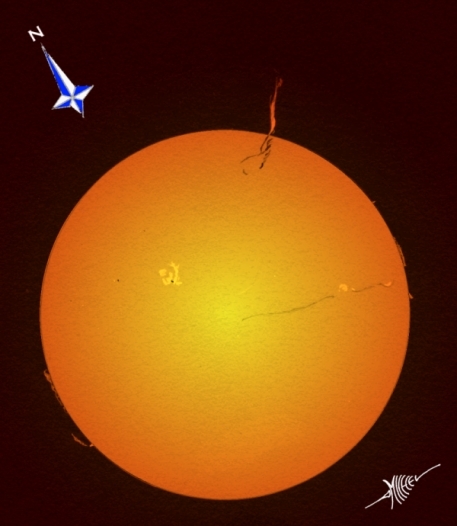 This star is also known, in religious terms, as The Foot of the Cross, due to obvious location reasons. 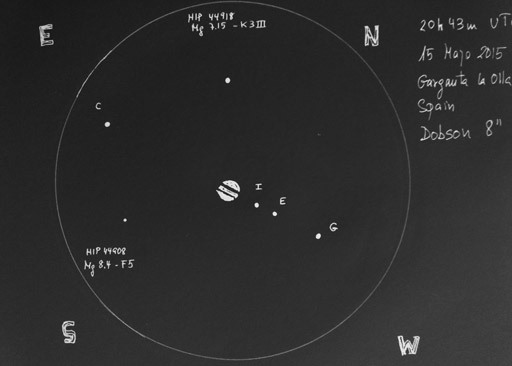 It’s a nice double-star system done in white paper, with graphite 4B, 2B and HB2 pencils; after edited with Photoshop tool, while observing with a Newtonian SW 150/750 f5 telescope. I liked the final results, so hope you like it too! 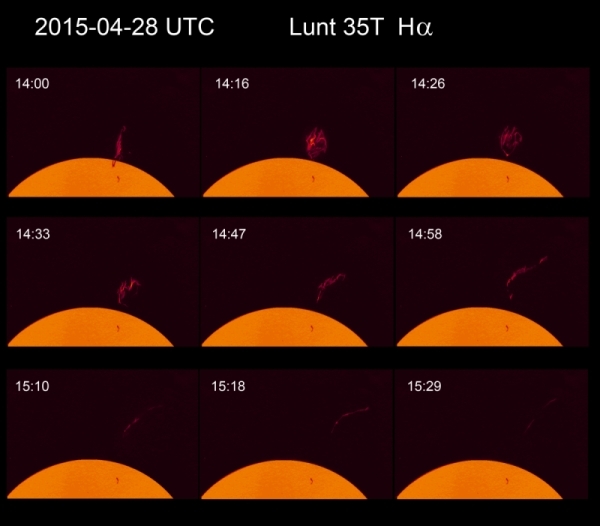 Date: 2015-04-01 / 23h 35m U.T. Assessments:I use the zoom eyepiece at 8mm position (44X), center brighter area of cluster and start to draw what I see, initially see little stars, and as I start acclimating sight see more stars and more clearly, some brightest stars and other stars least, I drawing that I saw, the Moon is almost full and does not help in the observation and I greatly clear sky. 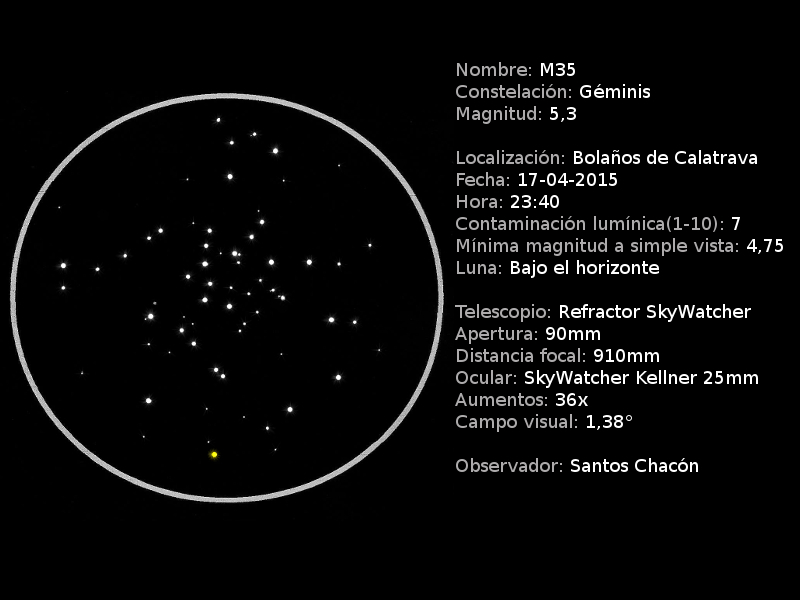 Comentarios: Utilizo el ocular zoom en la posición de 8mm (44X), centro la parte mas brillante y comienzo a dibujar lo que veo, al principio veo pocas estrellas, pero a medida que voy aclimatando la vista comienzo a ver mas estrellas y mas claramente, unas mas brillantes y otras menos, dibujo las que voy viendo, el que la Luna este casi llena no ayuda en la observación ya que me aclara mucho el cielo. 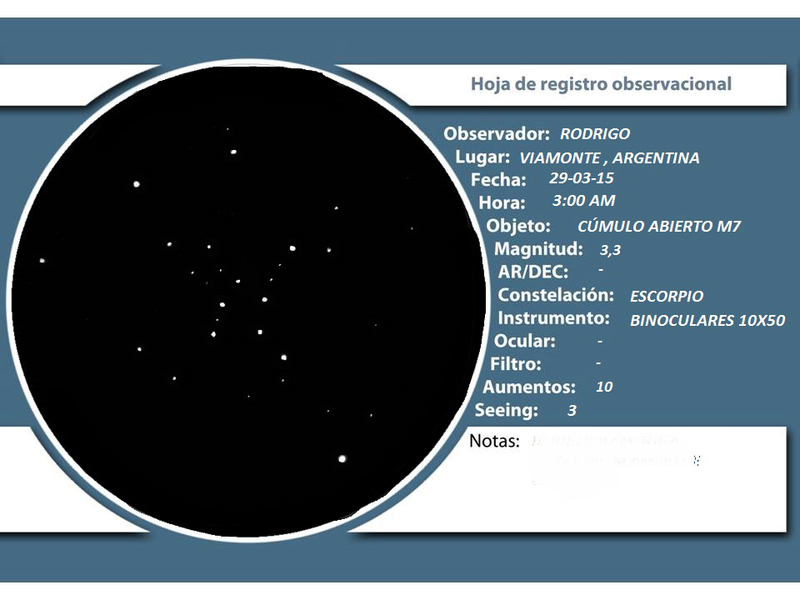 I hope you like , and greetings from Viamonte, Argentina !!!!!! Tools: Pencil HB, and white sheet. I send you a big hug and wished posteen my sketch, Greetings! Media: graphite pencil, white paper, digital tools. 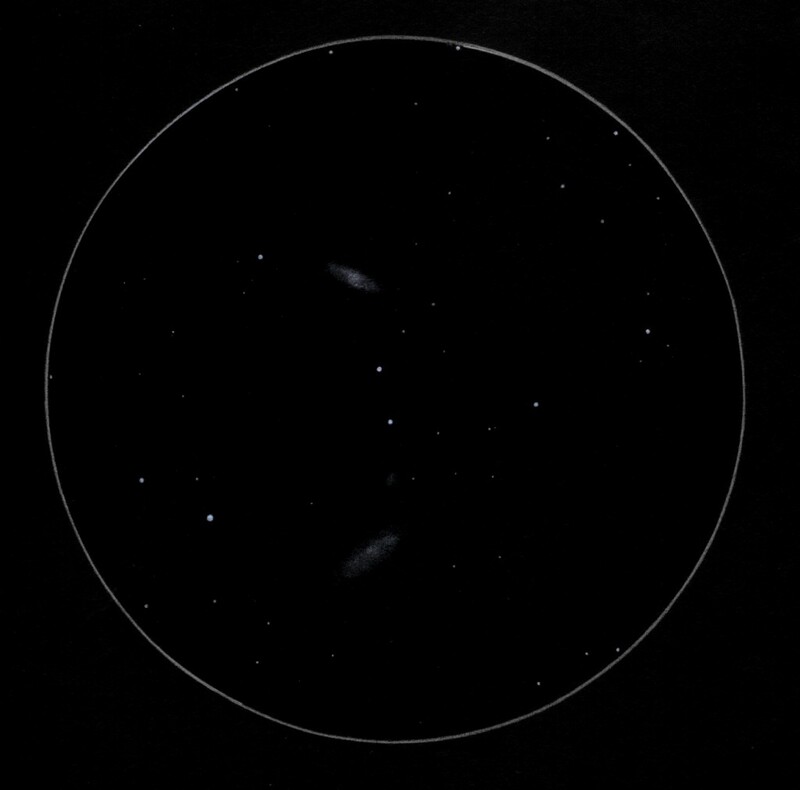 Please find hereby a recent sketch of the barred spiral galaxy M109 in Ursa Major, made during our astro-holiday in Northern France about a month ago. That night the sky completely cleared out with impressive SQM values around 21.6 – being amongst the highest possible in light-polluted Western Europe. 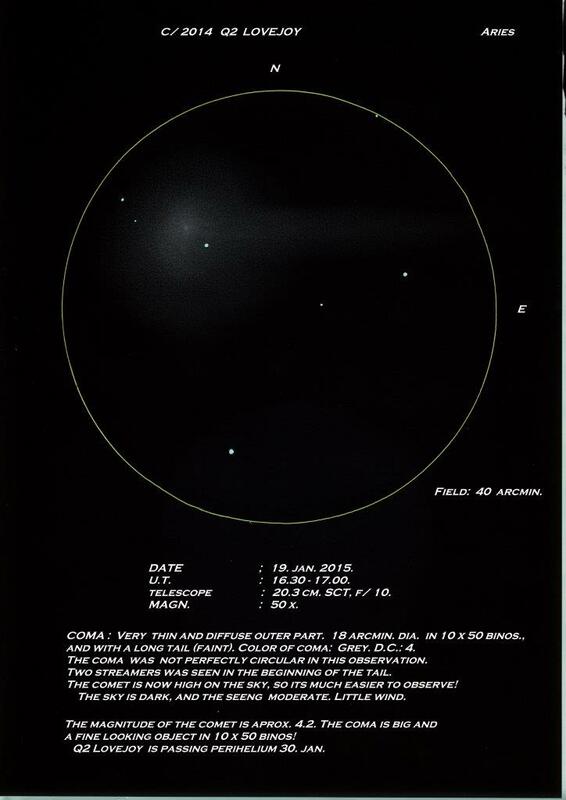 One of the objects scheduled to revisit was Messier 109, since it contains a complex barred spiral structure that is difficult to visually discern. Attentive averted vision under a dark sky though brings out these beautiful features! 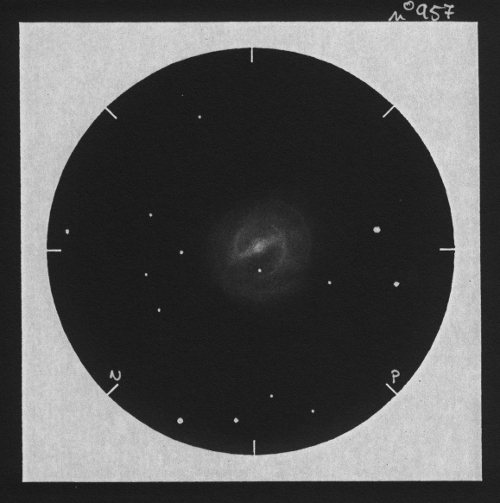 Large diffuse face-on galaxy, displays a bright core containing a diagonal barred structure through a round, mottled glow. Attentive averted vision brings out a subtle theta-like structure, less intense at the eastern side and more pronounced on the northwest and southern outer side. 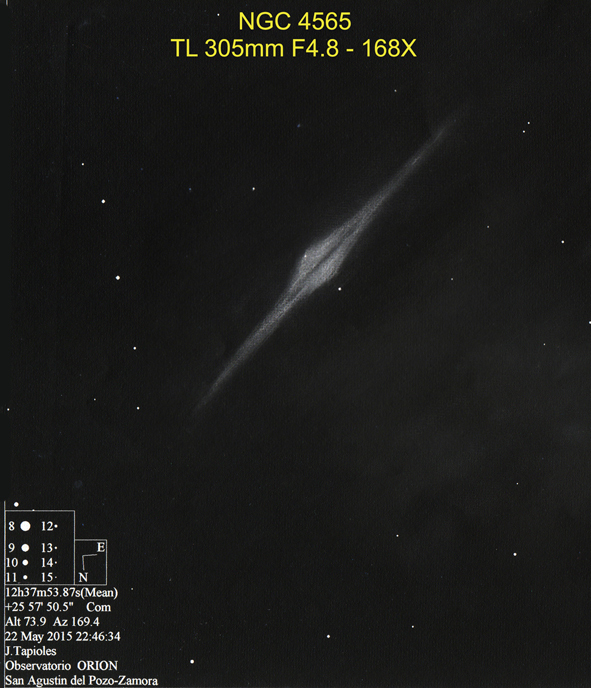 The inside of the barred spiral, to the eastside of the core, appears more dark and contains a nice faint field star. 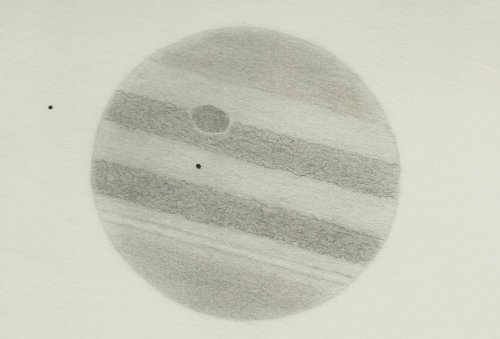 This sketch of my favorite planet of the solar system, that day their moons aligned, the great red spot and below this, the shadow of Europe, the picture was very rewarding and enjoyed meeting observation, but since the city only allows this type comments, try to have a place for these events really impressive. 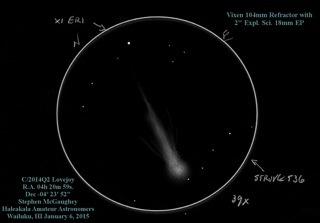 The original sketch was reduced and adjusted as is the eyepiece. Hi ASOD. I’m from Lincoln, Buenos Aires, Argentina. 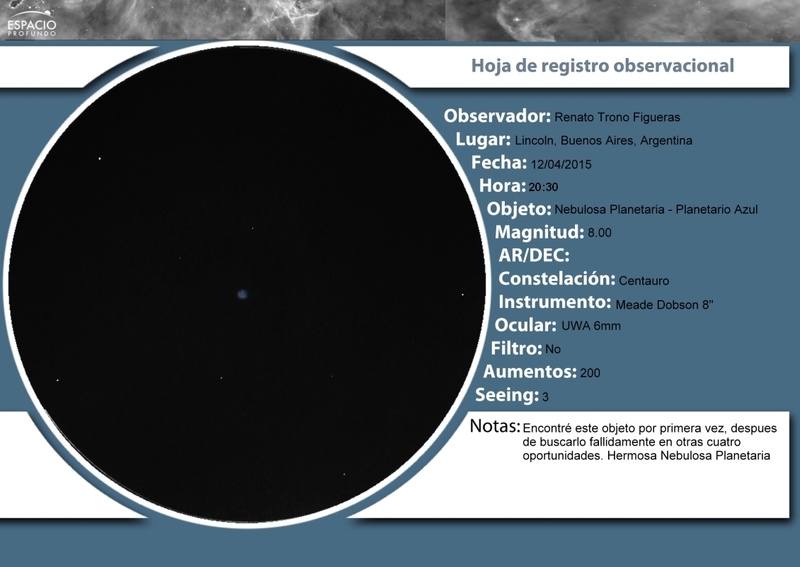 This is a sketch made in “El Triunfo”, Argentina. 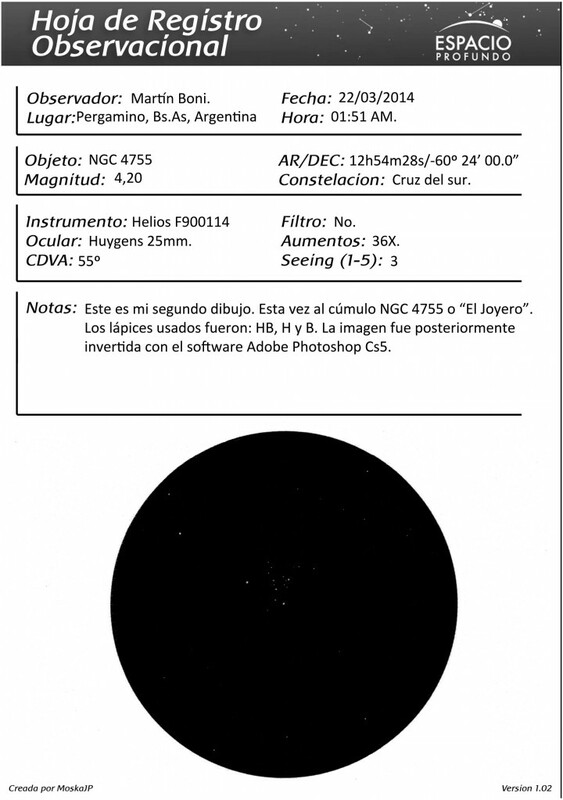 See this types of object are important opportunities for see different object than usually. 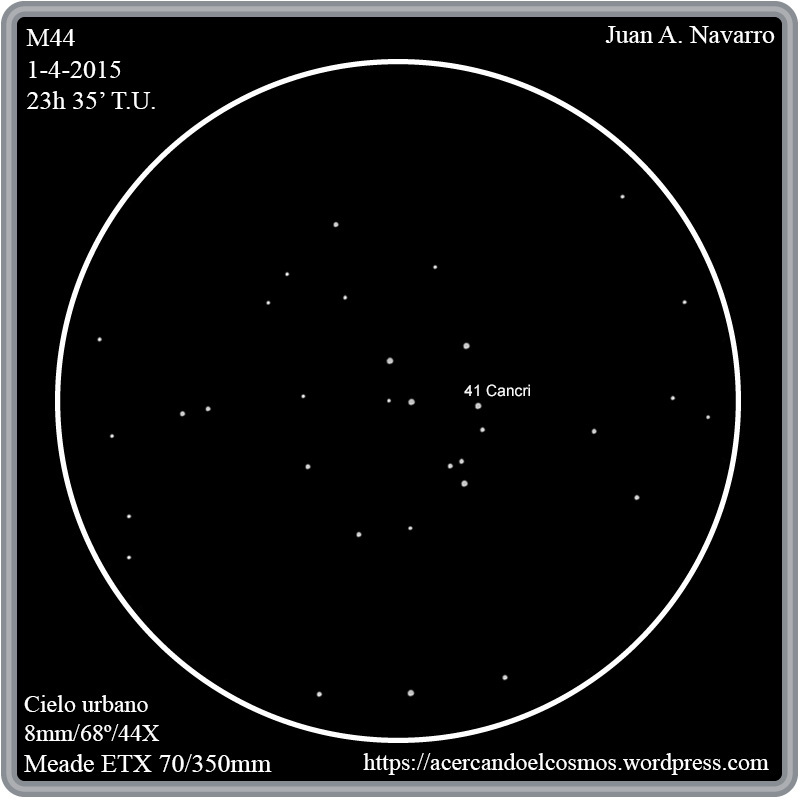 I’m very lucky for have seen this Nova. Date: 19/04/2015 at 2:30 a.m. In January 2015 comet C/2014 Q2 (Lovejoy) was really bright. 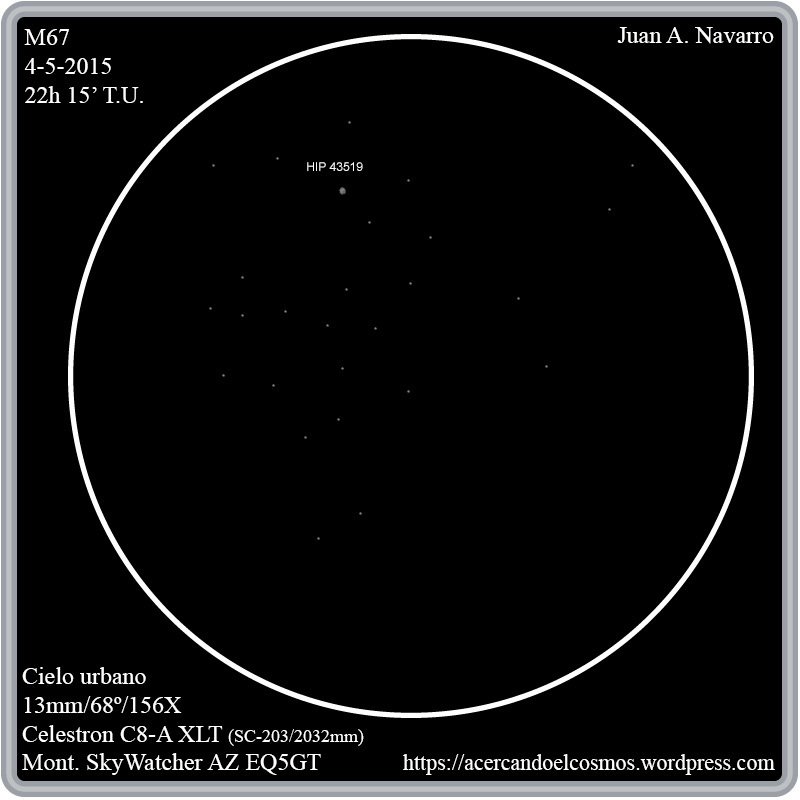 In big 22×100 bino view was really breathtaking.